Having been concentrating on our new three key sectors, it seemed appropriate to look at how sector affects salary expectations. Experienced graduates who have the highest salary expectations are those who work in the fields of Architecture and Interior Design, Electronics, Brokerage, Asset Management and Consulting. The closely related fields; Aerospace, Energy and Mining and Chemical and commodities also score highly. 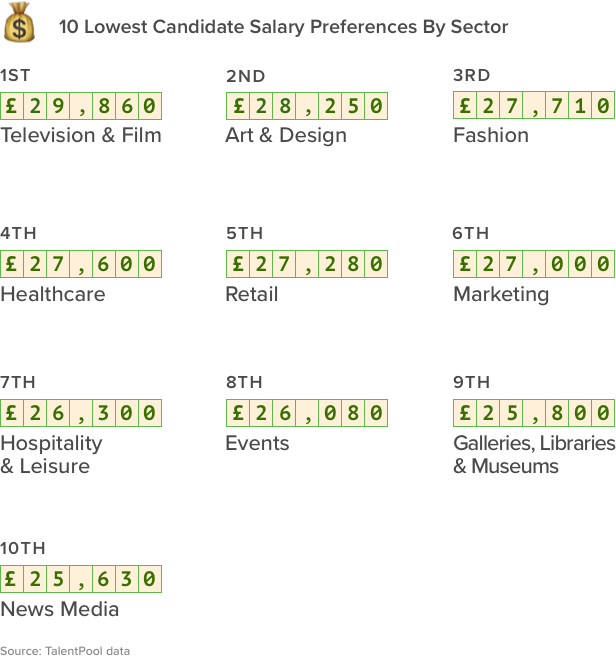 Candidates with the lowest salary expectations are those looking for work in Television and Film, Art and Design, Fashion and Healthcare which are in no way related to the top 10. It is unsurprising that candidates who want to work in sectors such as asset management, brokerage, architecture, and electronics have a higher salary expectation than those in film and television, art and design and fashion. This may result from the fact that these sectors are often more functional, for example, we can’t live without architects and energy providers, however, artists and designers are not necessarily vital to our existence. 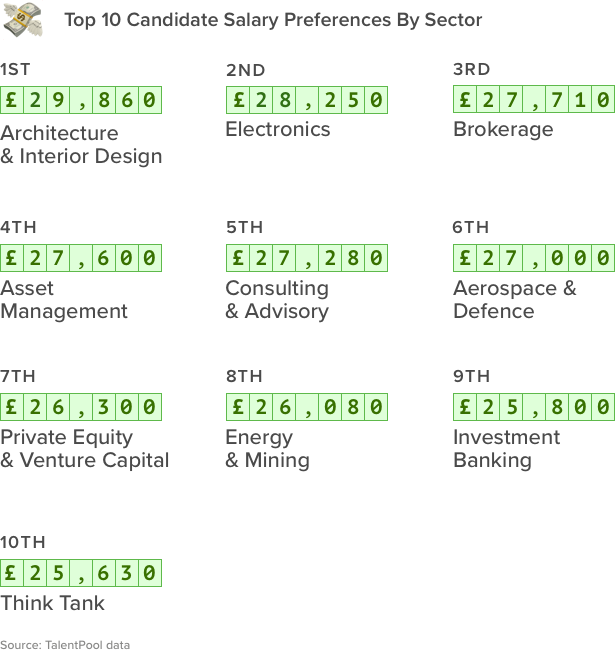 This, therefore, results in a higher demand for candidates to fill roles in these top 10 sectors. Candidates looking to go into the creative fields may have lower salary expectations because there is a huge gap between those who are paid the highest vs those who are paid the lowest. These discrepancies in salary don’t exist within the top 10 sectors as your salaries tend to increase more steadily as you move up the career ladder. In ‘How to be Awesome at Your Job’ Pete grills results-getters to discover how to boost work performance and how to be a good leader. In this episode, communications expert, Chris Westfall, discusses why language is vitally important in a leadership role and explains three ways to use language to get what you want. 60% of businesses experienced a data breach in 2013 and 2014 despite having privacy and data protection awareness programs. In this article, Small Business Trends takes you through some pointers to help protect your business from cyber criminals who are looking to commit fraud. After the announcement that John Lewis’ chairman is stepping down and Marks and Spencer plan to close 100 stores by 2022, it’s easy for start-ups and SMEs to feel concerned for their futures – if the big guys can’t manage it, then how on earth can we? !